I recently received 2 gorgeous soaps from Olhas Oils on Etsy. Olhas Oils is an online store filled with lovely soaps filled with natural ingredients which have endless benefits for your skin and general wellbeing! Natural scents are so relaxing to me, so I love to use soaps which are largely scented by essential oils and botanical extracts. The first soap that I have tried is the Charcoal and Oats soap. I've used charcoal products before and they really help to detoxify my skin. Whilst the charcoal helps to draw impurities out of the skin, the oats soothe and calm the skin. There's also some tea tree, lavender oil and sweet orange oil in there too so it has the most beautiful scent. I've been enjoying using this on my skin, it's felt really tight and clean after washing with this soap! I also tried the Tiramisu Soap Cake. Firstly, it looks so cute! Secondly, it has a lovely almondy scent to it. It's described as smelling like amaretto biscuits and I'd agree with this. It's fairly creamy when it lathers up and the almond scent becomes stronger when washing with it. 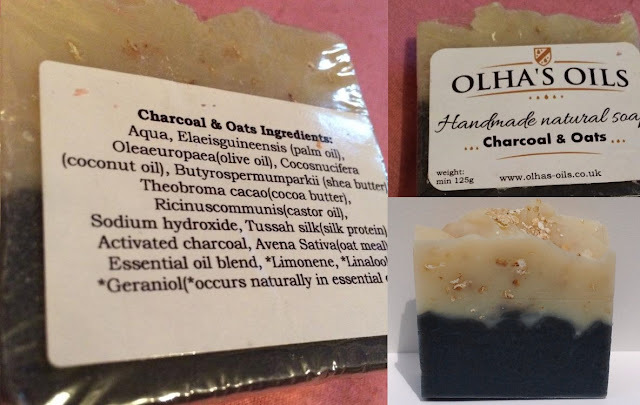 Check out Olhas Oils for lots more lovely soaps! Review: Works With Water - Help: Beautify Skin.